I thought it would be nice to do an 'inspiration post' like i did a while ago with the bedroom and livingroomdreams. As you know by now, i visit lots of blogs, both fashion related and interior and decoration related blogs. Both inspire me to no end and give me that awesome feeling that looking at beautiful and creative things can give you. 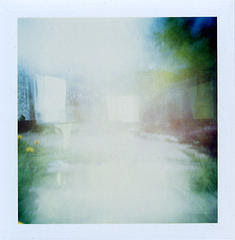 This morning i made this polaroid. I kind of like it. I think it's one of those rare September days the day started with a blue sky. I also feel a little sad summer is almost over, and in Holland summer never really begun. we had some nice and warm days, but i can't speak about a real summer unfortunately. 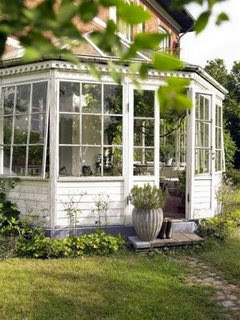 Wouldn't you love to have a beautiful gardenhouse like this? Sometimes (well, a lot lately, to be honest) i just want to leave Holland, to go to some place else. Would there be such a place? Or are you completely satisfied with the place/country you live in? Have a lovely day and night! Oh I do, I dream of having an open wooden house in the woods somewhere. but for the insects woul probably make it impossible to live in, i dream of meterhigh windowglasses.. have you ever seen this photo of a house where outside an elephant is walking by? something like that. where there is no internet but books only. where i would have a giant bedroom with a fireplace and a white bed where you can play hide and seek in. white. lots of white. very calm and close to the nature. something like that. what on earth am i doing in LA then. its the complete opposite. And omg, do I ever wish to live somewhere else! 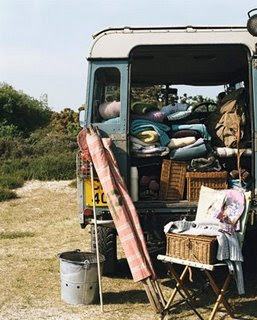 I want to live almost everywhere (well, not all at the same time, that'd be tough haha, one by one!) I've always dreamed of living in the Amazon Rainforest in a huge tree house! Maybe I'm weird haha. Goodness me, these pictures are magnificent - I want to live in all of them. The lace tree is quite beautiful too! i am currently dreaming of a beautiful coastal town south of where i am- full of farm land- rolling valleys and breathtaking ocean views- my partner wants to move east- the big city-ahh the joys of compromise-perhaps i shall show him this post and the romance of the quiet life to intrigue him! i'm in love with that first picture and chandelier...i posted on them a while back. i could look at them every day! totally chic. great inspiration post! oh wow, the lace tree is amazing! How's your sweet little nephew doing? 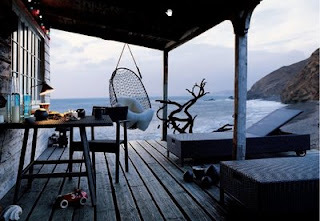 I love the wooden verandah with the hanging basket chair overlooking the ocean - that looks exactly like part of the house I dream of. 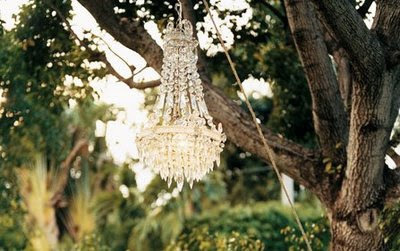 Beautiful...that outdoor chandelier has done wonders for me! gosh darling you have me wanting to move from cold england to Belize,mauritius or zanzibar! 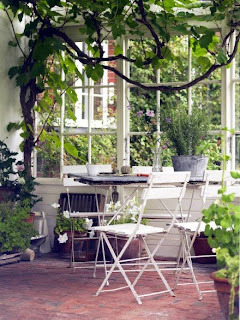 the images are beautiful and yes i adore that etheral garden house!you are a beautiful dreamer!keep dreaming dear. I so agree with danica^ And im always dreaming of living somewhere else - somewhere with more scope for the imagination mountains, snow all of that. I guess you always wish for the opposite of what you have. wow!! 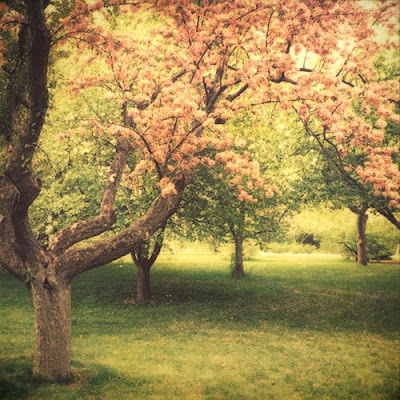 the lace tree is my favourite, this makes me want to get a lace cotton for my bed, great pictures. Ah, these are all beautiful. 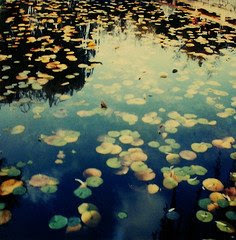 I think I will email your post to my boyfriend to convince him that we should move into a large house with wooden floor boards, a lovely garden like those pictures, with a pretty, clean, and white bedroom, and we each have our own room (he needs his painting studio, I need my photo studio/writing office). In time, I think soon, we will have this. There's just so much I love about this post Mila! 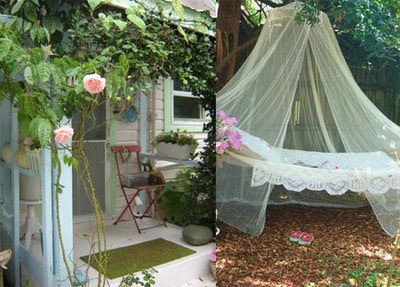 Now you've got me dreaming of lace covered trees, cannopied hammocks and porches overlooking the sea! I feel very lucky to have a big yard and a husband who loves to garden and make it a really beautiful space. We spend lots of time out there. Photo's always evoke that strong sense of emotion within me, sadness, happiness and everything in between. I'm sure its the same with everyone else really. I am one of the cold-lusters; Sweden, Ireland, Scotland, Alaska... But I wouldn't want to live in one place, I carry the genetic legacy of nomadism (or a serious case of A.D.D.)! I love the pink balloon (plastic bag?) 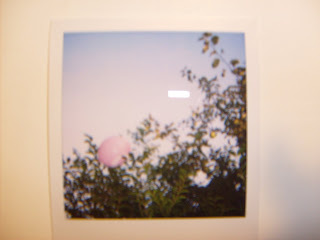 stuck in the trees of the polaroid you took! And I remember seeing some picture of trees wrapped in a delicate netty/web thing next to a picture of a girl wearing a torn up sweater (think Rodarte) and thought it was gorgeous. And while I love living in Hawai'i, I wish I could just be a traveler and move somewhere new every year because I get so bored with things after awhile! Living in another country is all I want to do. The experience must be so enriching, and personally fulfilling. 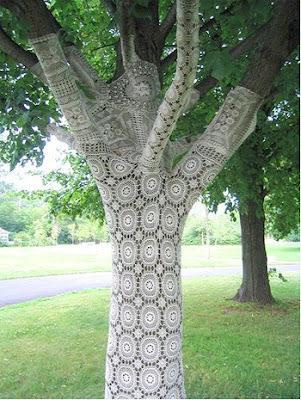 wow, the lace-tree is amazing: i'm hypnotized by it! I just gave you an award of love! Details on my blog. This may sound a little unlikely, but I actually started suffering from panic attacks during last year, too. Mine are not as severe as yours and I have only just started having them, but I think I can relate a bit to how it must be like for you to live with them. I think when I get them (it doesn't happen too often, but when it does, I know that's what it is as it is so different from anything else) the main feeling is that of losing control over yourself and like I become detached from my body somehow. Does it feel at all like that for you? Other symptoms include difficulties of breathing, feeling like you're about to throw up or faint. Behind all of this can be thoughts of going crazy or like you are physically about to die. All in all, it is a very scary experience each time; I feel weak, might be trembling, like my limbs don't listen to me. The thing is, I have only ever had a full-on panic attack once. It was terrible; I truly thought something was going to happen to me. Doomed thoughts had been piling up in my mind all day, and I had been listening to my body in a wrong way. So, it all built up into an attack, when I really thought I was going to go crazy or die. I had no idea what was going on with me. I couldn't breath and I was about to throw up. I was all alone during the whole attack and too embarrassed to say anything to my flat mates, which made experiencing it so hard, I think. Soon afterwards, however, I discovered it must have been a panic attack. I had heard from people who had them before and so in the end, it was easy to realise what had happened. Knowing what happens when it happend makes dealing with the attacks a little easier: now, after that first time, when I have had them coming, I have felt it and while it feels terrible as it comes, I know what it is, which stops it from getting all the way to the worst stage, as I know I am not going crazy or dying - that it is "just" a panic attack. Also, since realising I suffer from panic symptoms, I have understood I have been that way all my life. I have always been the type to get nervous easily; to be afraid of losing control and one who gets different kinds of physical symptoms when I get caught in a situation where I feel I have to do something I don't feel I am capable of in some way. Over the years, talking about my mental problems has become easier. Saying that may sound a little odd as I just told I only started having panic attacks during the past year or so. But, the thing is I have suffered from different kinds of neuroses (all of which I still find it very, very hard to open up about and even my family doesn't know about all of them) and fears throughout my life. It is only now that I have found the strength and the guts to start opening up about it all to others. Strangely (but also happily), my telling about my panic attacks to those around me has caused a wave of confessions: many people around me have told they suffer from panic attacks, or that they have had symptoms they don't know what they are but once they hear what a panic attack can be like, they have understood that might be it! It's incredible! In a way, I am glad people are finding it easier to speak up, about something they might need help with, especially as so many people may not even know what is wrong with them - they only fear their own feelings and weird physical states - but it also saddens me that so many people suffer from panic attack symptoms. And boy has it been raining in the past couple of days! There is a river I can see from the window, and it has been flooded in one day! Incredible! The situation is the same with other little rivers here in Finland, it seems. So, I am from Finland and I live here at my parents' place at the moment as I am on holiday from university to which I go to in London. I moved there a year ago, after having lived in the UK in different places couple of times before. I've been glad with the decision I made, and I just booked a flight to get back today; I am flying to London in couple of weeks, and until then, I am working and slowly trying to get things done. PS. 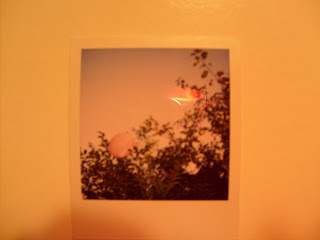 I like the polaroid you've taken. 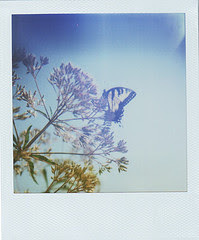 I think I have liked all of your polaroids thus far. Do you think you'll sell some of them some day or keep them all to yourself? I wouldn't blame you for keeping them! You know the lace three actually freaks me out a little bit for some reason... I cannot explain it further right now! 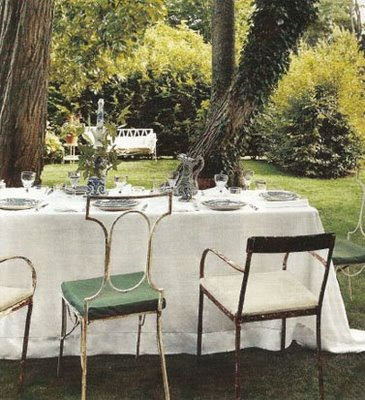 oh, goodness - that top image of the beautiful table outside confirms all my wishes for having an 'unbirthday' tea party in the backyard!! and I'd also love to line in those cars... 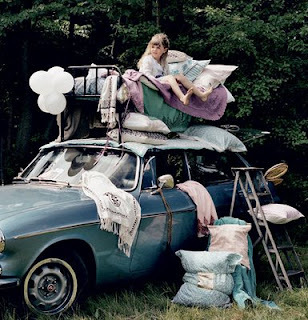 I'd be as happy as can be with a bed on top of a cute 'ol wagon! what wonderful comments and better yet, lovely photos. yes, an outdoor cozy spot year-round is a dream. 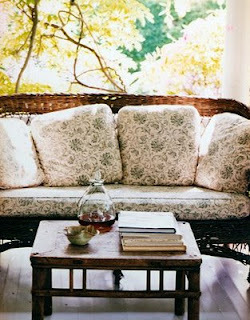 green climbing foliage, intimate space, dapples of sunlight, warm air, the softest pillows and bare feet. i have a fondness for mexico, either coast. the pace, the food, the music, the heat. a perfect winter escape, with outdoor veranda of course. although i do love my covered back porch here in the midwest (u.s.), cicadas singing right now, cool autumn air on its way. move to sydney!! 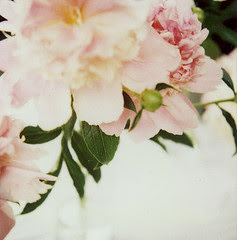 ;) great post and great blog! your pics are always such an inspiration to me. keep up the great work!